Kick off your Father’s Day celebration with a barbecue party or a hefty dinner with this fantastic, fall-off-the-bone meaty delight! Melt 3 tablespoons coarse salt and 3 tablespoons packed brown sugar in 1/2 cup simmering water. Add 3 (12-ounce) bottles cold dark beer, 3 bay leaves, 1 whole garlic (peeled and chopped), 1 tablespoon cayenne pepper, 1 1/2 teaspoons ground black pepper, and 2 teaspoons liquid smoke flavoring (optional). Pour over 2 kilos pork ribs and let it brine overnight in the refrigerator. Remove ribs from brine, place on a baking sheet, and cover with foil. Bake in the oven at 250oF for about 3 hours or until meat is very tender. 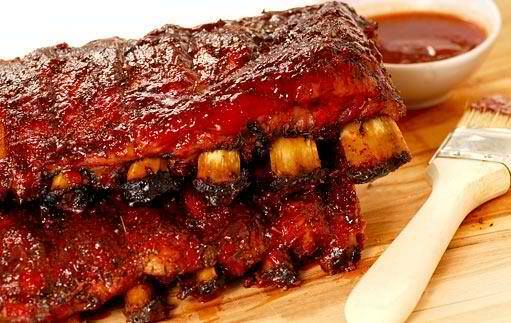 Remove foil, brush with barbecue sauce, and bake at 350oF for another 10 to 15 minutes. Make the honey-beer barbecue sauce: In a medium saucepan, cook 2/3 cup chopped onion and 1 whole garlic (chopped) in cooking oil until tender. Stir in 1 1/2 cups tomato sauce, 1 1/2 cups beer, 1/2 cup honey, 4 tablespoons Worcestershire sauce, 1 1/2 tablespoons mustard, and 1/2 teaspoons each cayenne pepper, salt, and pepper.